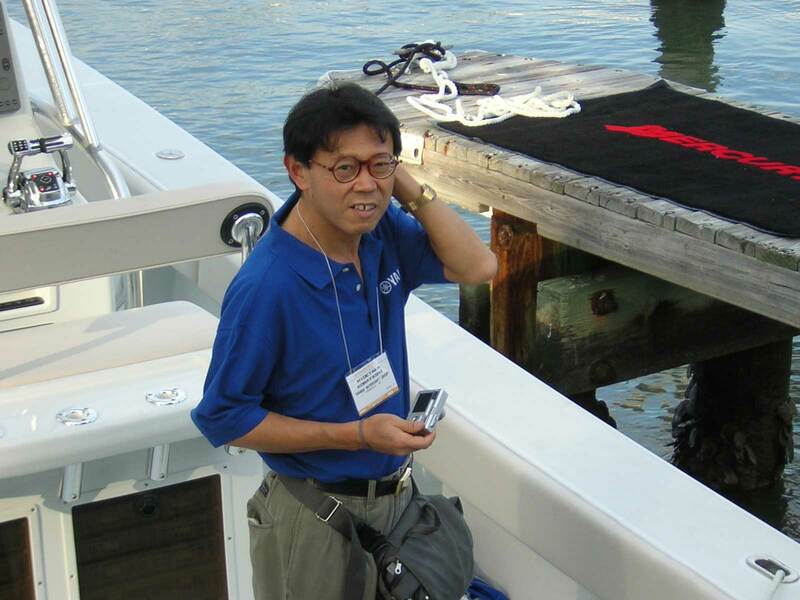 I had the pleasure of attending the Miami Boat Show last week. Here is a quick photo-tour of what we saw and did down there. 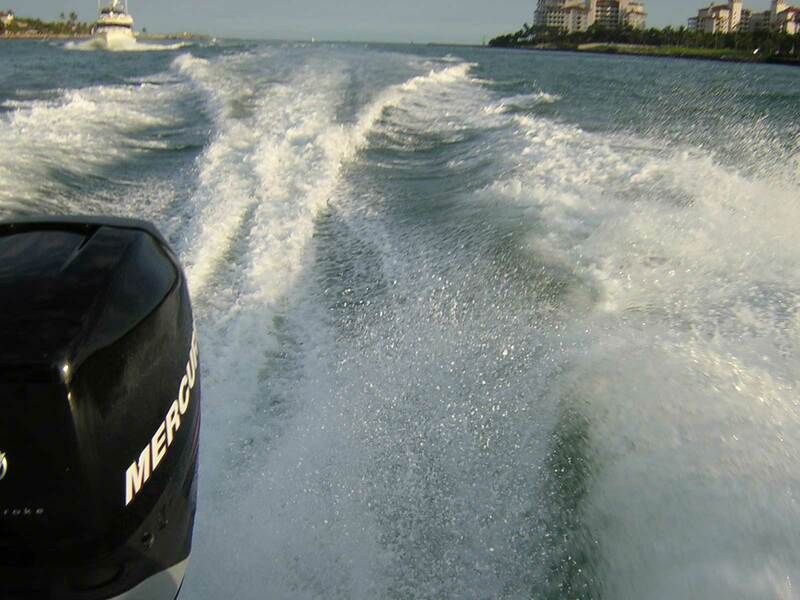 First have a peak at the new Verado engine from Mercury, then take a tour of Boston Whaler's new 305 CONQUEST and other boats at their show display. 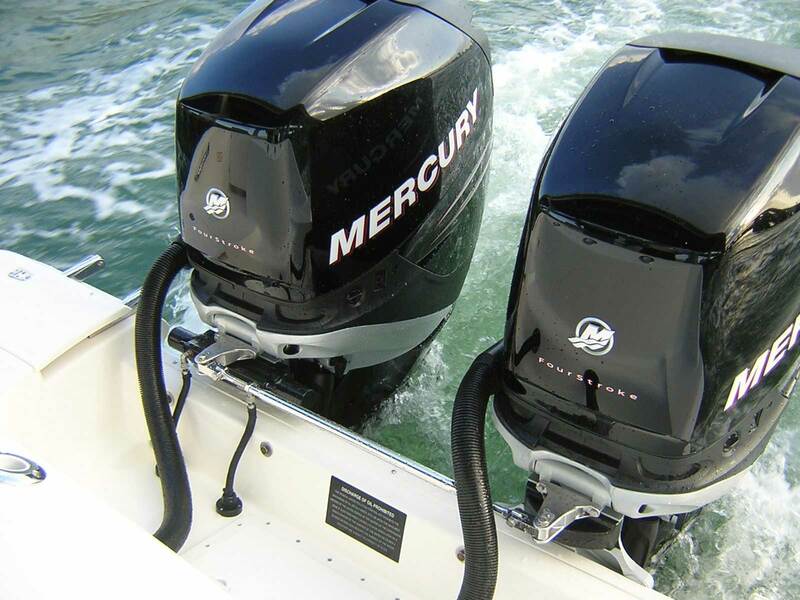 Of course, the main event on Thursday, February 12th, was the announcement of the new Mercury 4-stroke engine. Formerly "Project-X" in pre-release publicity and secretly "Family-3" in internal Mercury documents, the new engine was given the brand name VERADO. 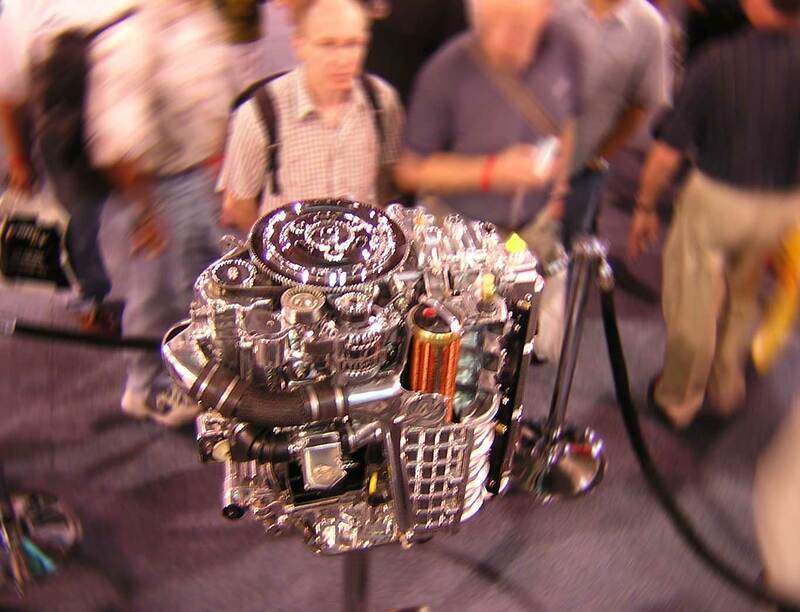 For more about the VERADO engines and the rest of the show, see my article in the forum. Elevated about a foot by a stand, the VERADO engine really towers over me. I'm 5-ft 10-inches and 200 lbs. The Verado is taller and more than three times my weight. You can see the DTS throttle and shift controls on the console. I was trying to get a good shot of the new electro-hydraulic steering but I seem to have included Mr. Hidetaka Kobayashi of the Yamaha Watercraft Group in the frame. The console is rigged with an SC5000 display, twin SC1000 multiple gauge displays, and five individual gauges. The combinations are endless. 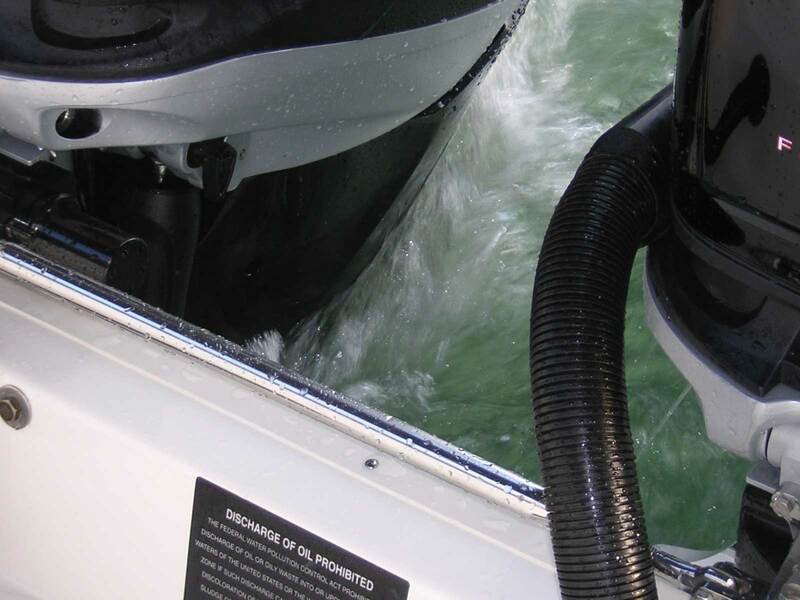 A pair of the new Verado 250-HP 4-strokes on the transom of a Boston Whaler 320 makes for a very clean installation. The port engine is counter-rotating and does not have the integral hydraulic steering unit. The hydraulic actuator is on the mounting mechanism and remains stationary as the motor pivots, thus the connecting cables can be short and do not need slack to move around the splash well. Tiller extensions are added to the engines and coupled with a tie bar for dual engine installations like this. The engine graphics are very nicely styled. 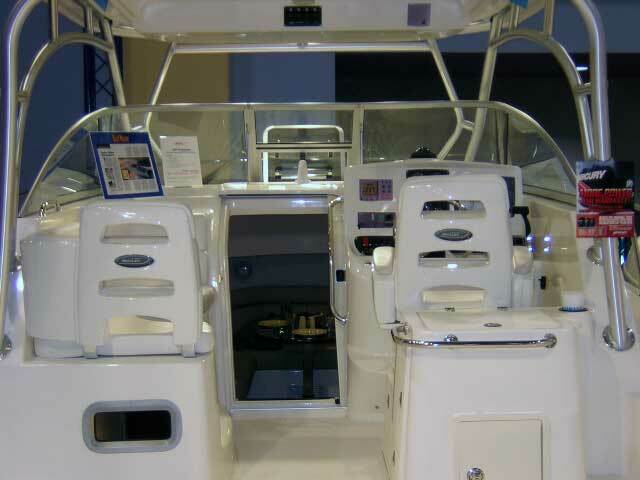 The 320 OUTRAGE from Boston Whaler is 13,000 pounds of boat in this trim. It leaves a nice clean wake as we cruise along about 40-MPH at Government Cut in the Port of Miami. The unusual shape of the mid-cowling and upper lower unit seem to facilitate very clean water flow at low speeds. LHG was impressed with the new engines, but he was not quite going overboard. The weight is a concern when re-powering older hulls. On the transom of this 32-foot boat they look more in proportion than indoors on the model stands. 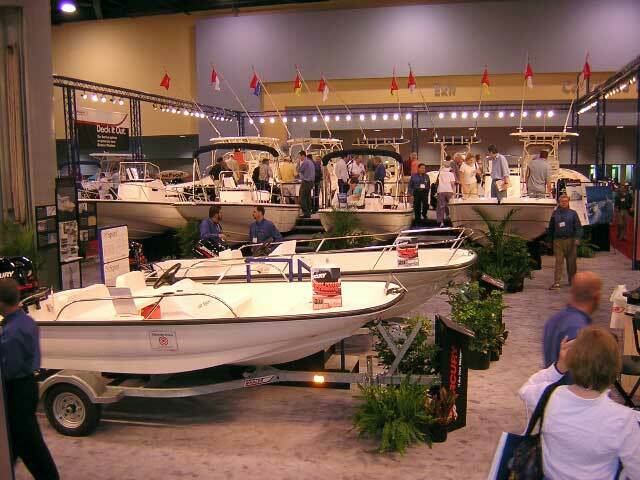 Boston Whaler had a very large display and brought their newest model, the 305 CONQUEST, to the show. 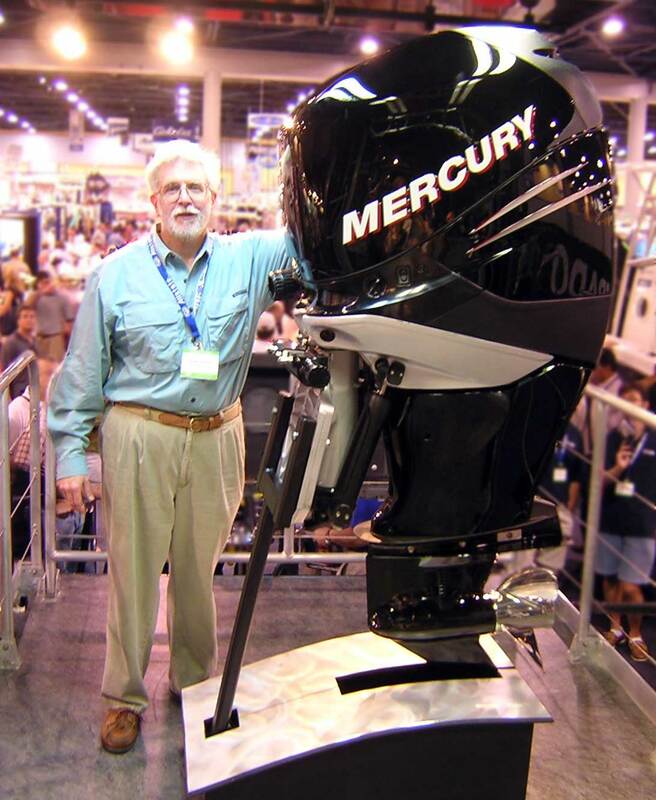 With a MSRP of $185,000—boat-show priced at $176,781—the big Conquest is at the upper end of the "outboard" boat range. This pushes Boston Whaler into the big cabin boat category with Grady-White's 30-foot-plus boats. 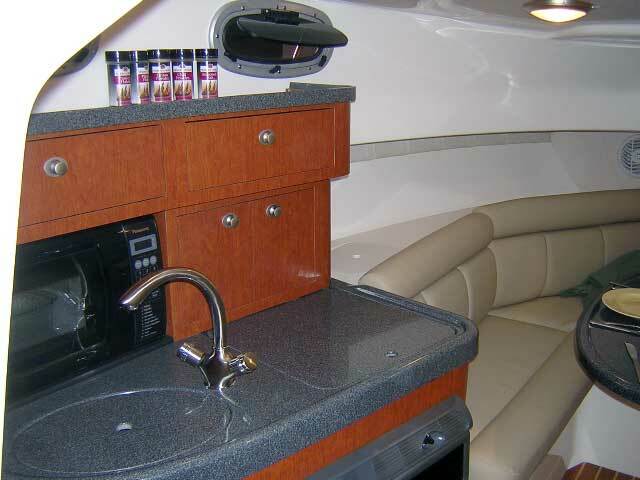 The 305 Conquest is just over 32-feet LOA including the bow pulpit. The boat carries 300-gallons of gasoline in three tanks. (Imagine what a fill-up at marine gas prices would cost!) Just the fuel on this Boston Whaler weighs as much as most 18-Outrage hulls. 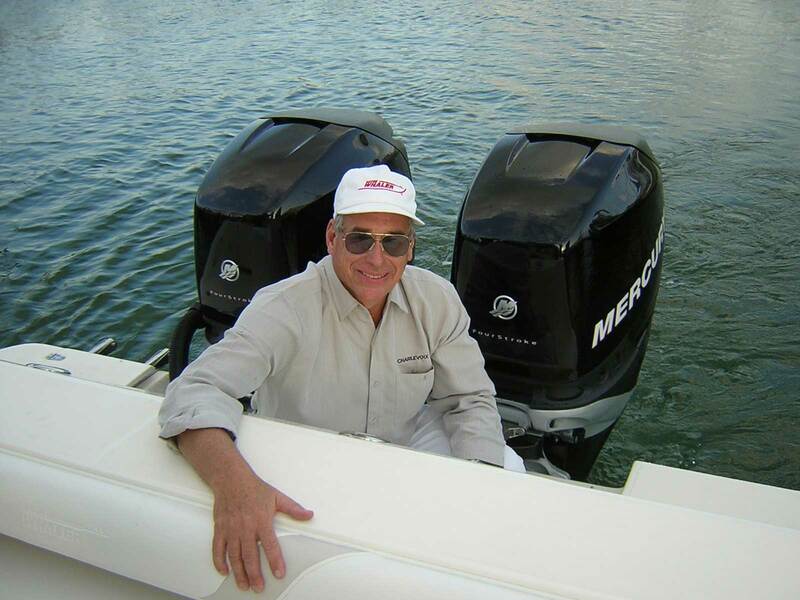 This particular boat also has the Cruise Package which adds a diesel generator and another (15-gallon) fuel tank. Coming from my modest 20 REVENGE, this new Conquest was a giant step in size, weight, and price, but I had to go aboard to give it a look. The wrap-around companion seat opposite the helm is what sells my wife on this boat. The cockpit has plenty of room. 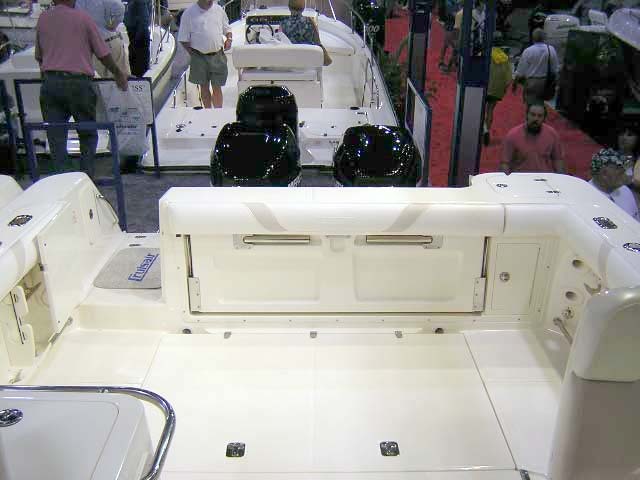 The transom has a hideaway bench seat. 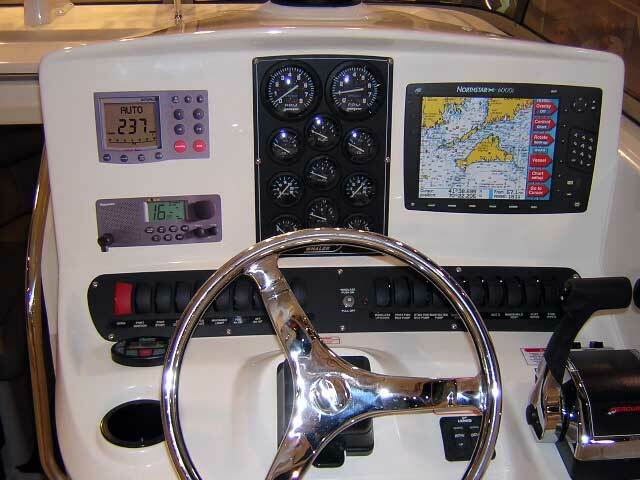 This boat did not have the now-standard SmartCraft guage package, but instead was rigged with this nice layout of conventional instrumentation (possibly due to it being rigged with the 4-stroke engines of Yamaha heritage). There are three fuel tank level gauges in the center column. Twin tachometers, trim, water pressure, and temperature gauges fill out the panel. 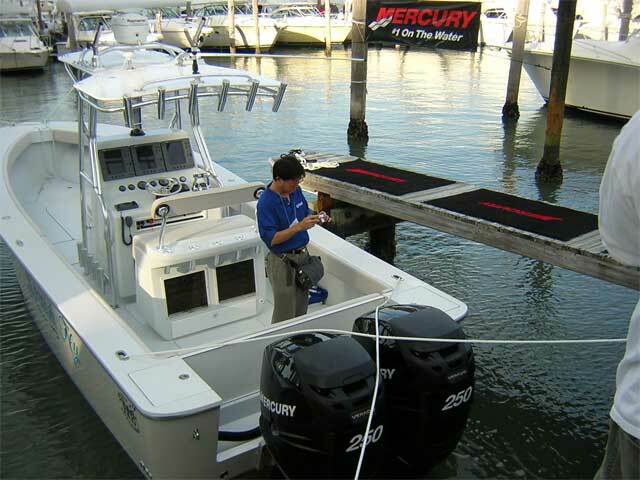 Lenco trim tabs are standard, and you can see the controls between the wheel and the throttle/shift. Again, the faux instruments are just cut-out vinyl appliques. 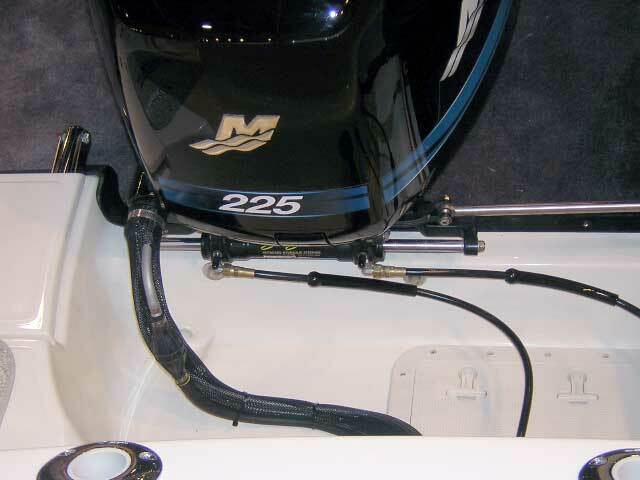 This boat has the 225-HP 4-stroke optional engines. They are steered with a single center-mount hydraulic cylinder. A nicely hinged tie bar connects the engines. Note the primer bulb in the rigging, oriented vertically just before the fuel line enters the cowling. 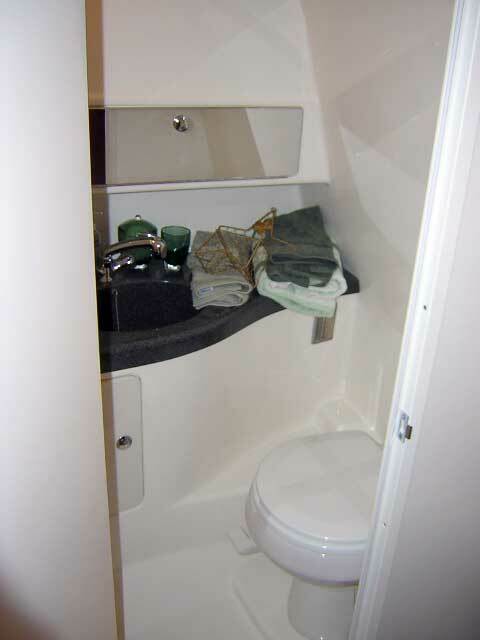 The cabin has very nice accommodations and includes a galley set up. 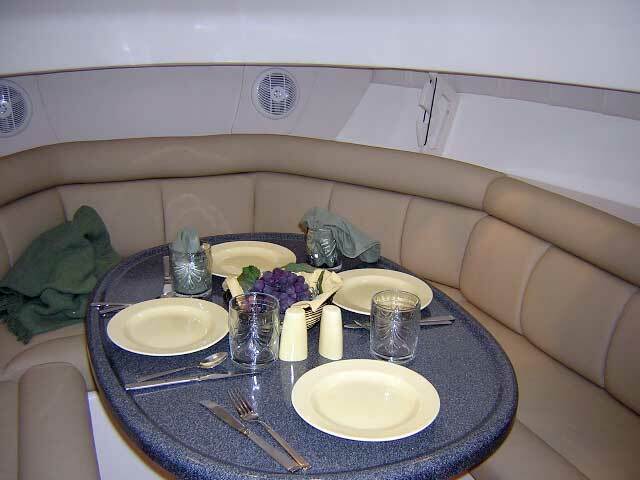 For the boat show manufacturers always dress up the cabin table like this, but I wonder if anyone has ever taken a meal at sea on a small boat with this much tableware. The starboard side of the cabin has an enclosed head compartment. The big advantage of outboard-powered boats of this size is the space saved in the mid-cabin area by not having to use it for the propulsion plant. 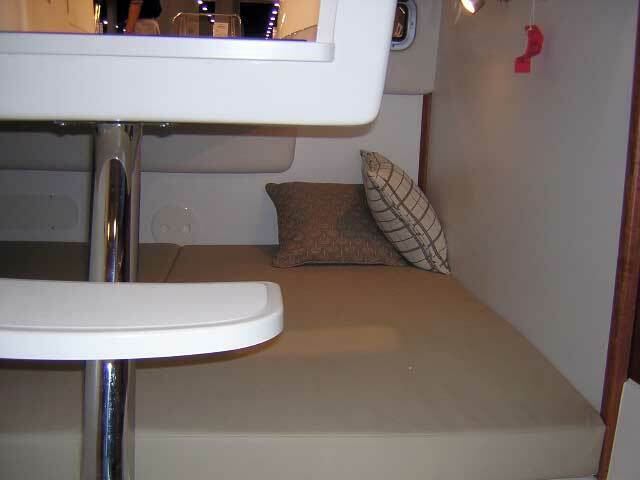 Instead of a pair of V-8's you get this nice mid-cabin berth. 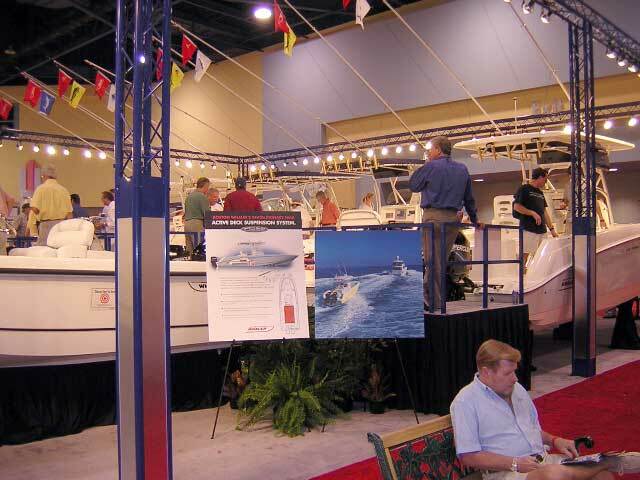 Boston Whaler had a large indoor exhibit at the Miami Convention Center with a dozen or more boats. That signage in the center shows a 320 OUTRAGE being towed as a tender. Surprisingly, sales of that boat into the luxury yacht tender market have been good! The new 110 SPORT was also prominently featured, but did not seem to attract as much interest as the larger boats. LHG had a long conversation with Will Rogers, S.E. 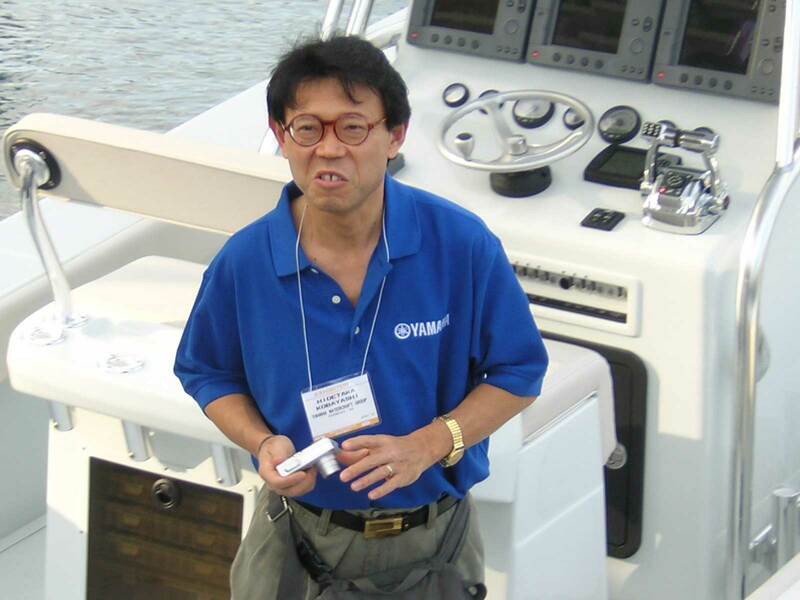 Regional Sales Manager at Boston Whaler. 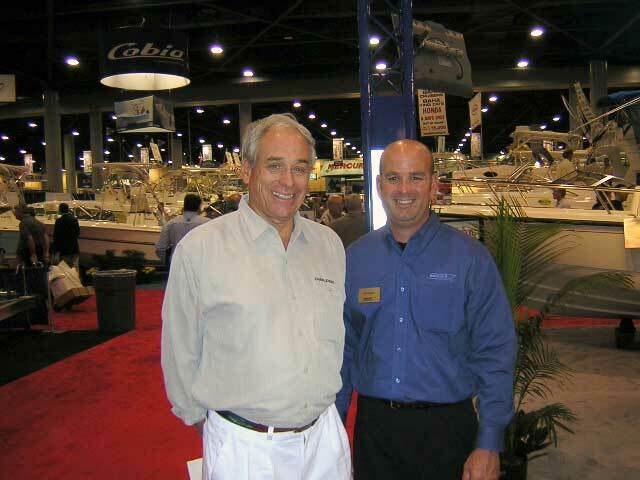 He encouraged us to return in April for the factory sponsored Boston Whaler Owners Open Fishing Tournament in Stuart, Florida. The event drew a nice crowd last year—don't miss it! It will be April 16-18. There will be plenty of prizes and promotions, and a host of Boston Whaler and Mercury people will be on hand, along with many other Whaler owners. For more information call 800-WHALER9. The page has been accessed 57025 times. This article first appeared Febrary 16, 2004.